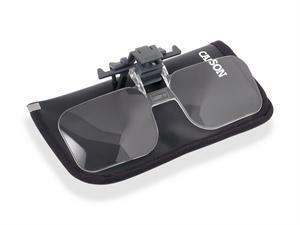 Carson OD-12 Clip & Flip are flip-up 1.75x magnifying lenses that turns any pair of regular glasses into "Flip-Down" hands free magnifiers. 1.75x Magnification Equivalent to +3 Diopter. Included with the magnifying lenses is a pouch. Dimensions 4.625" x 2.25" x 0.5"